As you go about planning your digital marketing strategy for 2019, it’s worth considering the latest trends and shifts in social media budgets – which platforms businesses are spending the most money on, where they’re seeing the best returns and how the lessons they’ve learned have changed their approach in each respect. To help with this, we recently conducted a survey within the Social Media Today community to get some perspective on the latest key trends, and the experiences of digital marketers within our ever-shifting online landscape. Over 500 social media marketers responded to our survey, providing relevant insight and perspective into a range of different factors. You can download a full overview of the report here, but over the next week, we’re going to break down each element and look at what the results mean, where future opportunities lie, and how you can, and should, be building this into your strategy. There are some key insights here for any businesses looking to improve its digital marketing performance – in this post, we cover the third part of our analysis of our survey results, which will hopefully help you chart a course for improved performance moving forward. We’ve now entered the next evolution of social media marketing, where awareness of what the medium is best suited for, and is able to facilitate, is becoming increasingly clear – i.e. 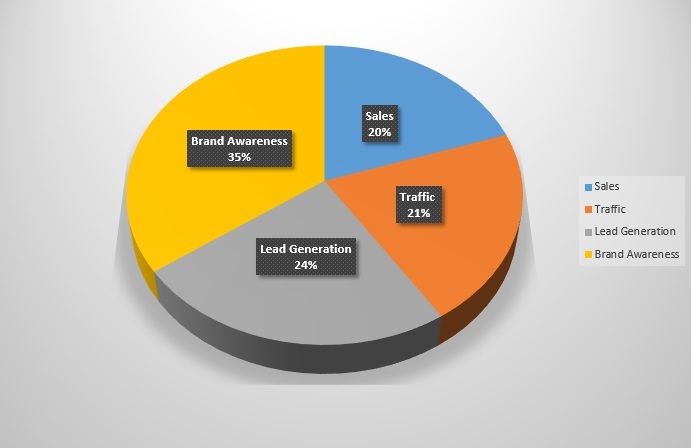 brand awareness is definitely where social is best suited, whereas direct sales, less so. That’s not to say social platforms are not beneficial for direct sales, and they’re looking to become even more so, with the addition of on-platform shopping tools to boost direct purchase behavior. Indeed, Snapchat, Pinterest and Instagram have all made eCommerce an element of focus over the last 12 months, with each introducing direct buying options, clearly linking online efforts to offline results. Facebook has also tried to push similar through Messenger, and while the Messenger bot revolution hasn’t taken off as yet, it still might, but it’ll take a bit more effort for Facebook to get users to see Messenger as more than a basic connection device (which they somewhat acknowledged with the ‘de-cluttering’ of Messenger through a re-design launched in October). While all of these tools are evolving, it’s good to see that most social media marketers are now focusing on ‘Brand Awareness’ and ‘Lead Generation’, the two areas in which social can help the most within their broader efforts. Gone are the days where social media platforms are seen as a savior, a key option to turnaround a brand’s fortunes and lead to immediate sales, direct from your tweets. As any marketer with any experience knows, it doesn’t really happen like that – social can help at each stage of the buyer journey, but you need to be aware of how it does so, and what you need to provide to each segment with your community in order to facilitate such. More than anything, the results here show the increased business maturity around social media marketing – and while the platforms themselves are still developing new tools to better link social media efforts to bottom-line results, the focus on aspects outside of direct sales is a more realistic, and beneficial, alignment for the current social media industry. Consider this in your planning, focusing less on direct selling (with posts about products and offers), and more on expanding awareness through content which links to your brand values, showcases your connection to your community and speaks to your buyer needs in each phase of consideration, and you’ll be able to drive better, more tangible results. You can download the full Social Media Today State of Social Spending Report here.